I thought this was silly. Shouldn't it be mini MINI Cooper? I guess it's not common knowlege that MINI is the make and Cooper is the model. Either way, it's a mini MINI. ;-) And the look on Conan's face every time he knows a writer's sketch is stupid is priceless. Plus that MINI has two stubby antennas. Weird. Scan to about 18 minutes in if it doesn't queue up. Yup, that's right. I was bitten by the dragon bug last summer when I drove through but now I wanted to see what it's like when a whole bunch of MINIs take over. Registration is seems fairly low so well see how it goes. It might be nice for the roads not to be over saturated. Either way, I am excited to get down there and ride that dragon roller coaster! Not sure what I would celebrate as the birthday of my MINI; the built date or the delivery date. But a couple of days ago (3.18) marked the day my DS/B MCSa was completed at the factory and awaiting transport to the states. Three years so far and no signs of letting up. 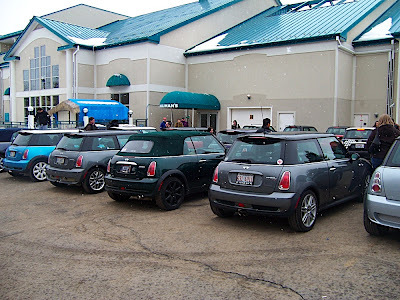 The annual CMMC Spring Forward Drive took us on a nice trip this Sunday up to Lake Geneva where we met up with the Milwaukee MINI club and ate a good lunch at a restaurant I like to go to a lot, Houlihan's. After a quick stop at Culvers in Burlington, WI, we headed for some nice side roads on our way to Lake Geneva. Check out the pictures below. On a side note, there was a "MINI Motoring Against Cancer" Banner at the event which raised almost a thousand dollars for the American Cancer Society. The banner will be heading out to AMVIV and hopefully out to the dragon in a couple months.